I'll get right to the point: Having heard most of the big name string quartets from the past forty years, it is my belief that the Borromeo String Quartet is not only the finest playing today but is well within the top five chamber music ensembles of all time. Quite a bold statement, and it almost gets a bit embarrassing from all the gushing and fawning that I have previously written and am about to do in this article. As if this sentiment needed any additional corroboration or illustration, this concert, held at and sponsored by St. Stephen's Episcopal Church in Durham, was ample artillery for this argument. In one glorious afternoon, a fortunate group of music lovers had the unique experience of hearing all six string quartets written by Béla Bartók (1881-1945). It seems that sometimes beautiful weather can have as much of a negative effect on concert attendance as inclement. I must scold the Triangle music community for not showing up for such a musically historic event, as the church pews were about half-filled. Warm, sunny weather should not be an excuse for sitting out such a monumental concert. Late night infomercials say, "but wait, there's more!" 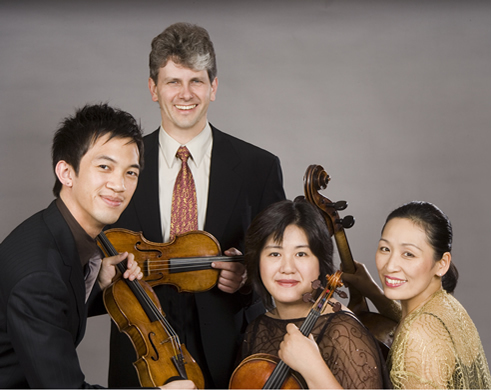 The Borromeo String Quartet, celebrating its twenty-fifth anniversary, consists of Nicholas Kitchen and Kristopher Tong, violins, Mai Motobuchi, viola and Yeesun Kim, cello. This is the second time local audiences have had an opportunity to hear them perform the complete Bartók cycle in one performance – the last time in 2003, at Duke University. (At that time, the second violinist was William Fedkenheuer.) Most two-evening presentations and even many recordings stick to an all-even and then all-odd numbered order – perhaps out of a fear of numeric asymmetry. The Borromeo String Quartet presents them sequentially, straight through, which is the order in which they were composed (not always the case). So, with their Apple laptops fired up – which is how they each read their parts from the entire scores – they were ready to begin a musical journey of unparalleled invention, beauty, difficulty, and nearly incomprehensible mental and physical stamina. The program was broken up into three sections each containing two quartets, in order of composition. Quartets 1 and 2, although often labeled as "early" works, are actually nine years apart and quite different in character. From the first few measures of the first quartet, completed in 1909, we can already glimpse Bartók's obsession with counterpoint as a quiet canon occurs between the violins followed by a pairing of the viola and cello. As if to announce that the spirit of Bach is alive and well in the 20th century, but on his terms, Bartók transformed polyphony into his own language throughout nearly every movement of each quartet. The central allegretto movement is sort of a demented waltz which leads to an explosively rhythmic finale which hints of the hyper-energetic movements in the later quartets. The second quartet, from around 1917, is also in three movements, but Bartók now seems to have completely found his own voice, and 19th century musical shadows no longer have a chance of impinging on his uniqueness. It was likely that nearly everyone at the concert had heard the Borromeo String Quartet before, perhaps many times, which was kind of a shame. I always enjoy hearing the reaction of Borromeo rookies, usually along the lines of "who are these guys, they are incredible!" Indeed they were – and the best was yet to come, but first there was a brief break to take in the warm, sunny Sunday afternoon. The Third Quartet was written in a mere three weeks in 1927, and at 15 minutes playing time it is by far the shortest. In four movements, played without pause, it alternates harsh dissonances with almost classical-like passages. Perhaps it was the audience getting anxious for the incredible dinner or fatigue setting in from just listening, but there seemed to be a wavering of attention during this work. I like to think it was more the anticipation of the Fourth Quartet in the on-deck circle: Bartók's most performed and certainly one of the greatest chamber works of the 20th century. Its internal form is often referred to as an arc or arch form and it may indeed be the apex of Bartók's six quartets. Five glorious movements, each bringing forth something that probably has never been uttered before. The second movement is monstrous, on a smaller level, as it musically depicts what it's like to turn the light on in the kitchen and see thousands of bugs scurrying around. The rhythmically crisp and accurate playing, especially at very soft volumes, was astounding. The central movement is a powerfully melodic lento that showed off the ravishing tone of Yeesun Kim on her ancient cello (by Peregrino Zanetto, built in 1576). A bows-down all-pizzicato allegretto is next, featuring the famous "Bartók pizzicato," which asks players with multi-million dollar instruments to lift the strings with such force that they smash down on the fingerboard, making a whacking sound. This is followed by an allegro molto with seismic energy. Most of us were just left with a dumbstruck look of "wow" on our faces. Then the dinner bell rang! The meal was described as "light" but I beg to differ. A wonderfully spiced goulash was accompanied by various crepes, cucumber salad, paprika-cheese spread, poppy seed pasta (a favorite of Bartók), and delicious red wine. Along of course with the music, this provided everyone with some of the best things in life. Add to that numerous Hungarian dessert specialties and strong black coffee and it became a bit difficult to urge everyone back for Quartets 5 and 6. Many thanks to St. Stephen's, chef Gyula Szilágyi, and the Hungarian Club of Durham for such a generous and delicious meal. The Fifth Quartet, completed in 1934, seems to subside and relax a bit from the fourth, and Bartók's final quartet, finished in 1939, has the word "mesto" (sad) before all the movements. Although six years from the composer's death, during this time he had to deal with his mother's death plus the situation in Europe, so these were far from happy days. There were three hours of playing some of the most intense, difficult, and mentally and physically exhausting music ever written, but when it was all done, all four players looked as if they could do it all again. I try to compare this with something else, perhaps some athletic feat, but anything I can imagine comes up short when compared to the enormity and perfection of what the Borromeo String Quartet accomplished, not only here but also several times a year. Sitting through anything for three hours takes some degree of mental endurance even for the audience, but the Borromeo String Quartet is on such personal and intimate terms with these works that they "simply" lead you along a long, fantastic journey without any lessening of interest. Add to that the fact that I did not hear even one lapse in intonation, rhythmic precision, or ensemble tightness in three hours of playing, and it becomes the burning bush of musical performance. In the Woody Allen film Manhattan, there is a scene where he makes a list of the things which make life worth living. If I were to do that, I'd certainly include hearing the Borromeo String Quartet live – regardless of what they are playing.